Nothing beats our popular Texas gift boxes, filled with arrangements of our tastiest treats! Now you get to share these delicious gourmet gift baskets with your friends, family or coworkers. Love Creek Orchards offers a variety of gift boxes for quick shipping to your address. Our bakery gift baskets, like our Hill Country Breakfast gift box with a combination of our apple strudel coffee, fluffy pancake mix and delicious syrup, are always a delight. Of course, breakfast gift baskets aren’t the only type that we offer– there’s also the Harvest Favorites gift box, which combines handmade jams, jellies, apple butter and our tasty baked breads. These bakery gift baskets are excellent for occasions of all kinds, including parties, breakfasts or simply sharing your favorite treats wherever you go. They also make excellent Texas corporate gifts for the office or workplace. Browse our selections, and find your favorite combination to enjoy! The perfect gift for a coffee break at work. Brew one pot of Apple Strudel Coffee, slice one Love Creek Bread, and spread on some Jam or Apple Butter. A wonderful gift for those who love homemade breads and jams. These unique and delicious breads will make any occasion special. At Love Creek we use a blend of fresh apples and select fruits to make our all natural jams and jellies. Love Creek Apple Bread Knife included. Customize your gift box with your favorite selections of three of your favorite jams, jellies or apple butter. She knows just what to say to make you smile, cheer you up and support you. 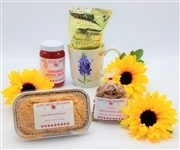 Make it a very Happy Mother’s Day with this gift basket full of Love Creek Orchards goodies. Truly delightful - bite after amazing bite. She'll love it but never more than how much she loves you! Order your basket today for $39.99, includes shipping.